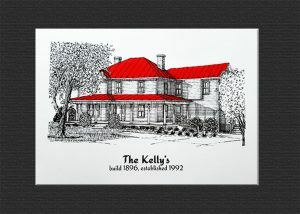 If you have ever driven through Holly Springs, you will spot the home with the beautiful red tin roof. This home is owned by a lovely family that purchased it 25 years ago. Being built in 1896, it was in a state of neglect and disrepair. Christine and her Husband lovingly restored the home, making improvements and adding the noticeable red tin roof. My sketches are almost always black and white but with this particular sketch, we thought the red colored roof would be the ideal touch – making the drawing more like the actual home. Christine was able to surprise her husband with this gift in December. If you have special memories about your home, snap a picture and we can create an heirloom piece of custom artwork – you will cherish forever.